If you live in NYC or are visiting the Big Apple this week I think Bowery Whole Foods is the place to be tomorrow night (Thursday, Sept 13th, 2011). I totally read that wrong, it was tonight. Please excuse me, I work with middle school children all day, I am exhausted by night time. Well… I would visit there anyway. I am most definitely going to check it out next time I go to NYC. They are opening a new specialty department called The Brinery – a whole department dedicated to all things pickled! They are having tastings of pickles, cheese and beer at the opening event. One of my favorite pickle vendors, McClure’s will be featured in the tastings. They make great garlic and dill and spicy pickles. They also make potato chips (which I have not tried yet but I have read awesome reviews) and my favorite Bloody Mary Mixer made with their spicy pickle brine. 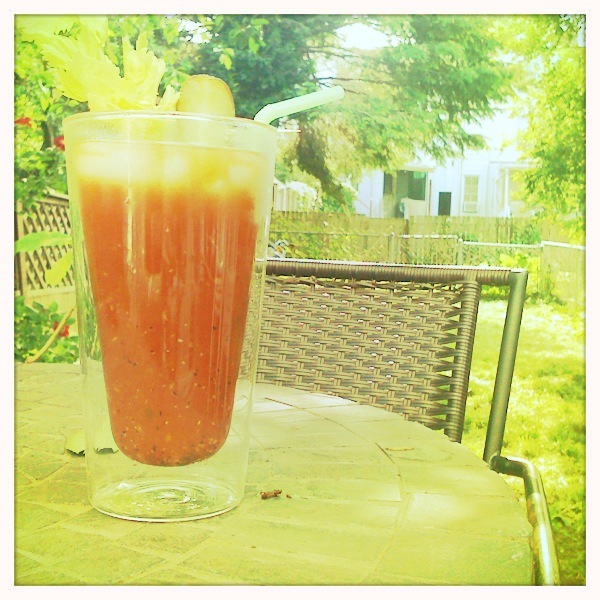 Here’s one I mixed up… I put a pickle in it along with my celery for an extra salty garnish. Put it all in a cocktail shaker, shake it up and pour over ice, garnish with a pickle and a stalk of celery. I have been a little obsessed with pickling in the past few months… I have pickled all kind of vegetables this summer. I have tried making my own pickles out of several types of cucumbers, with success! Other veggies I have been successful with include: okra, carrots, yellow beans, green beans, onions, and asparagus! Look for a new blog post for a recipe and pictures of all my pickled veggie adventures.